Noticeable shift to blue color tint when the phone is tilted out of perpendicular view by ~20°, most noticeable with bright or white backgrounds. I had a chance to look at a Samsung Galaxy S8 this week, which has a far more pronounced color shift problem, when not looking straight at the display. At the screen edges you can see a slight shift in hue, also most noticeable with bright backgrounds. True Tone sometimes feels a little too “warm“ to me, but I keep it enabled since otherwise everything is way too blue if you are inside especially with incandescent light. I have disabled Night Shift and use True Tone only. I had no problem to use the iPhone X with polarizing sun glasses, no color shift or drastically reduced brightness, no matter if the device is used in portrait or landscape orientation. This is a big improvement over the LCD displays that in portrait orientation were hard to read with such sun glasses. Bright backgrounds don’t suit the iPhone X screen well. 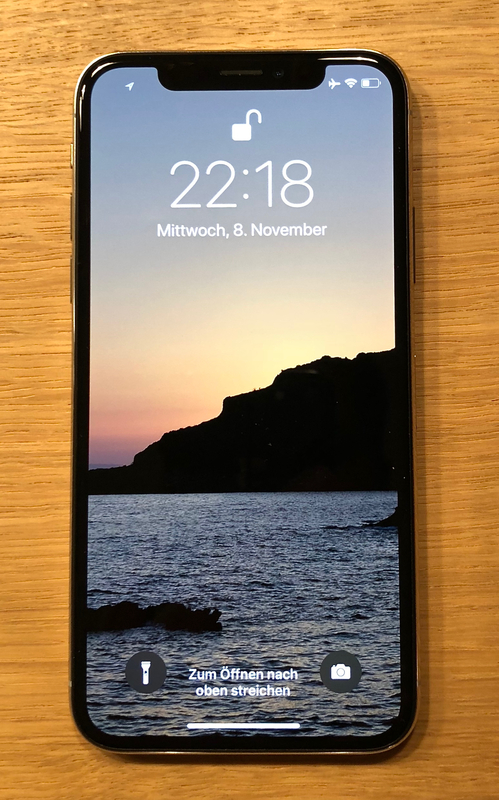 Dark backgrounds make the slight problems with off-angle viewing almost unnoticeable, promote the great contrast the display has and black background lets the bezels and the notch completely disappear. 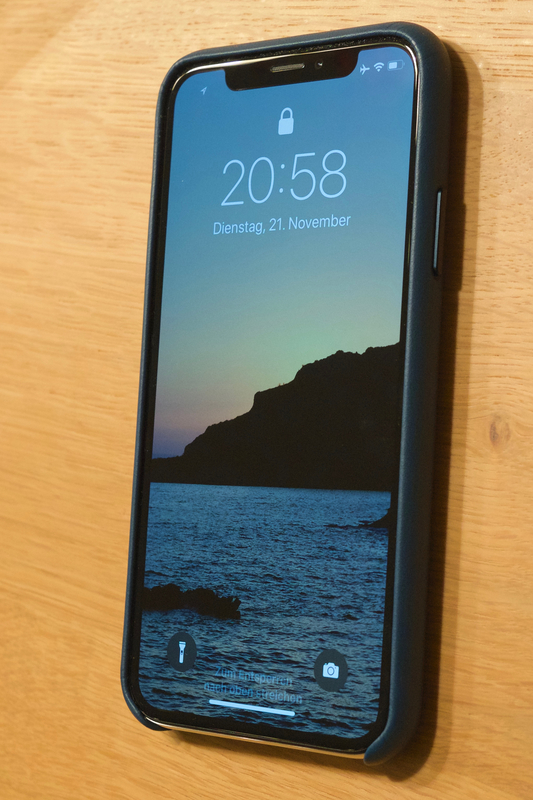 Speaking of the notch, I don’t mind it, most of the time don’t even notice it, except when you switch to an app with bright background. I actually like having the time and status shown up there in the “ears”. My brother wasn’t able to unlock my iPhone X with FaceID. Although many people confuse me with him, FaceID is able to distinguish us. Using FaceID in apps that did already support TouchID and to fill passwords from iCloud Keychain works frictionless. Coming from a Plus sized iPhone, it feels nice to have a big screen in a much smaller device. The iPhone X has its heft without feeling heavy. It feels good in the hand. The glass back improves the grip, so that I am confident enough to use it without a case. 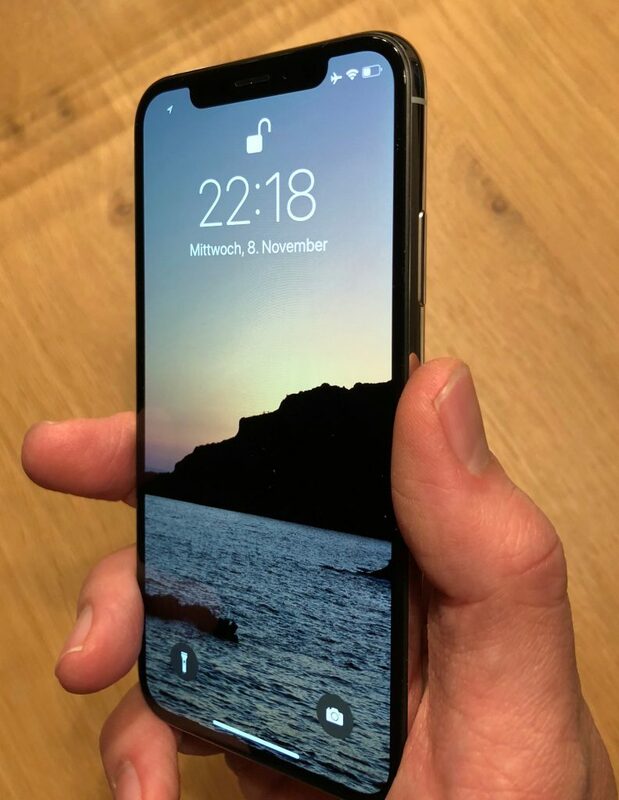 Using iPhone X feels like the original iPhone again, instead of sliding to unlock you now swipe up to unlock and you are good to go. No authentication interrupting you. With FaceID you have the benefit of security, without the hassle of a passcode. FaceID is slower than 2nd generation TouchID, but I never had the impression I was held off or had to wait for it. The animations for unlocking, multitasking, opening and closing apps are so smooth and feel so natural, it’s a fun to use this phone with its new gesture based UI, even just going back and forth between apps or to the Homescreen. I don’t miss the Home Button! Swiping up from the Home Indicator to “uncover”, go home or activate app switcher feels natural. The quickest way to activate the multitasking AppSwitcher UI is to already start moving your finger to the right while swiping up. Force quitting apps has become a little more effort on iPhone X. 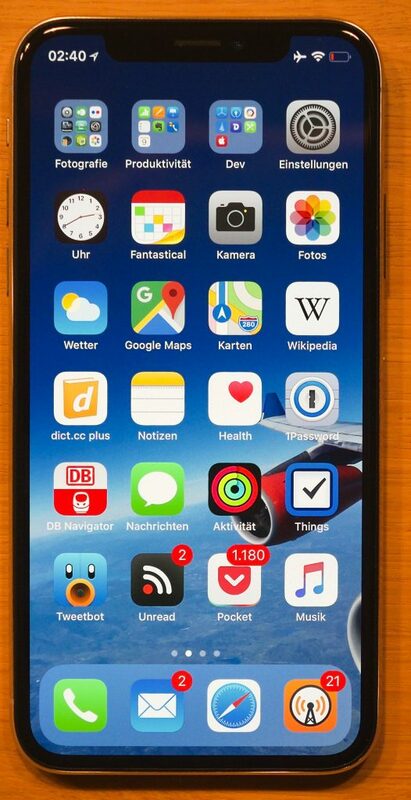 When in AppSwitcher UI you need to tap and hold an app until a red minus icon appears top left, now you can either tap this icon to “kill” the app or just swipe up as you were used to. Activating Control Center from the top right takes time to get used to and is hard to do one handed. As a result of this I am using Control Center way less than I did previously. You can activate the flash light by pressing the new button on the lock screen, but I would really like to see Apple change how to activate Control Center by integrating it into the multitasking UI as it is on iPad with iOs 11. I have tested Reachability and turned it off again, the UI feels weird if you combine Reachability and activating Control Center or the Cover Sheet for notifications and widgets, too much sliding going on. Switching apps by swiping horizontally in the Home Indicator area is nice and easy, sometimes though an app you would expect to the right is no longer there but seems to be resorted in the stack and you must swipe right to find it on the left side a few seconds later. Tap to the wake is another seemingly small addition that feels overdue when going back to others iPhones that don’t have it. I am not the selfie guy, but having portrait mode on the front camera is a great addition. Portrait Lighting is officially still in beta, but the studio light setting looked good in my tests, better than default natural light. Results for the Stage Light effect vary, but often look not good enough. Indoors the iPhone most of the time does not use the telephoto camera, but does digital zoom, unless it’s really bright. 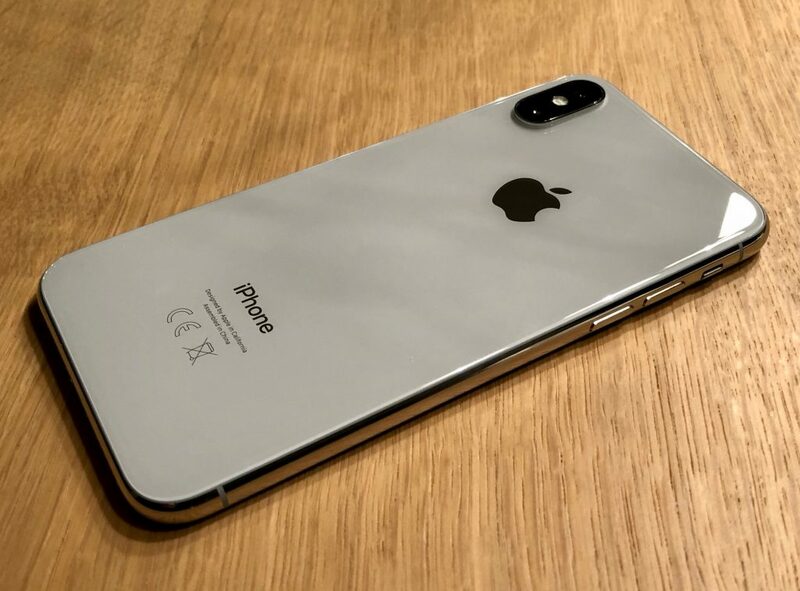 Given the small sensors used in the iPhone cameras – compared to the Google Pixel – it’s surprising that iPhone keeps up so well in image quality. Apple obviously has perfected image processing algorithms with its custom ISP. In a direct comparison of the iPhone 7 Plus camera with the Google Pixel, that I did last year, the iPhone had no chance matching the Pixel’s resolution and details, which is no surprise given the difference in sensor size. The iPhone had slightly better color rendition and overall exposure. If you are not pixel peeping, the iPhone images often look a little more pleasing and therefore often win in “real world” comparisons. After spending more than two weeks with iPhone X, battery life seems at least on par with my iPhone 7 Plus, which means even at the end of a long day with intensive usage I have about 20-25% of charge left. On a regular day or on the weekend I sometimes end the day with more than 50% of charge left. Without really timing it, charging it with a 10 W iPad charger felt quicker than with older iPhones. Charging with the Qi inductive charger integrated in the stand of my HP S240uj display at the office worked without problems. I currently plan to integrate a Qi charger in the wooden night stand that I plan to build over the Christmas holidays when I am on vacation before I return to work in the new year. More on that later. This was the first time I used the Quick Start feature that lets you transfer settings from another iOS device by just holding it close to the new iPhone. After the settings are transferred it is just a few steps until your data is restored from an iCloud backup. Having to do an over the air update to iOS 11.1 during this process was a new experience to me. This was the first time I didn’t restore a new iPhone from an iTunes backup, so I was a little nervous, but the process was smooth and everything went well. Waiting for all apps and data to be downloaded took longer than restoring from iTunes, but succeeded flawlessly. Even activity data that seemed to be missing at first reappeared after a while. Important advice for Apple Watch users: Unpair your watch on the old phone before setting up the new one. This will backup all data and once the new phone has finished initial setup it will automatically detect your watch, let you pair it and restore the watch from the backup. Animoji are fun and it’s stunning how detailed the facial animations are. Don’t show them to your kids, if you want your phone back anytime soon. Interesting to see that Animoji do not include your tongue, though. After just a little more than a day with the iPhone X the screens of older iPhones already feel letterboxed and strangely square. I always want to swipe up now, being forced to use the Home Button on older iPhones feels cumbersome. Animated WiFi signal strength indicator and the animated plane in the status bar “ears” when switching Airplane Mode are cute little details. iPhones always lacked in their ability to cling to a weak cellular signal compared to the simple feature phones that I used in the early 2000s. iPhone X pleasantly surprised me. It stays better connected to the cellular network during my daily commute train ride than the iPhone 7 Plus that I used before. Instead of spending 229,- € on Apple Care + I decided to buy an Apple Leather Case in Cosmos Blue. 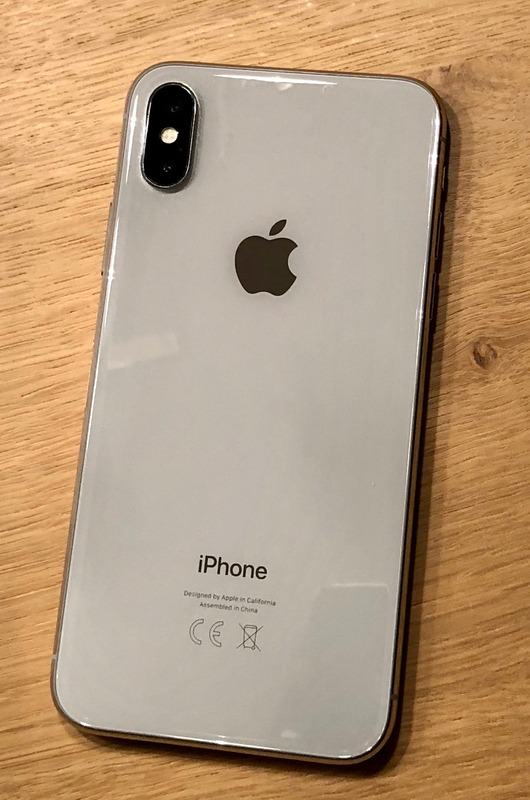 The buttons on the iPhone X Leather Case are made of aluminum in a color matching the leather. 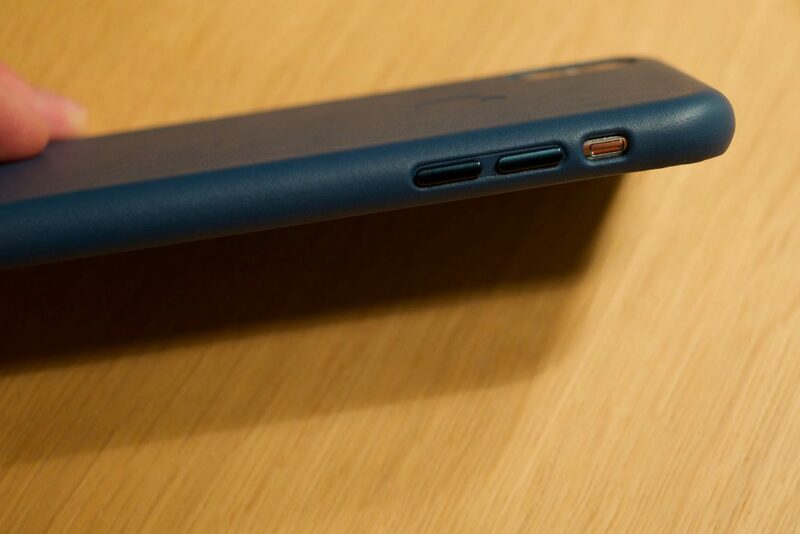 They feel good and are easy to press, much better than in the leather cases before iPhone 7, which just had slightly embossed leather for the buttons, which made them feel mushy. 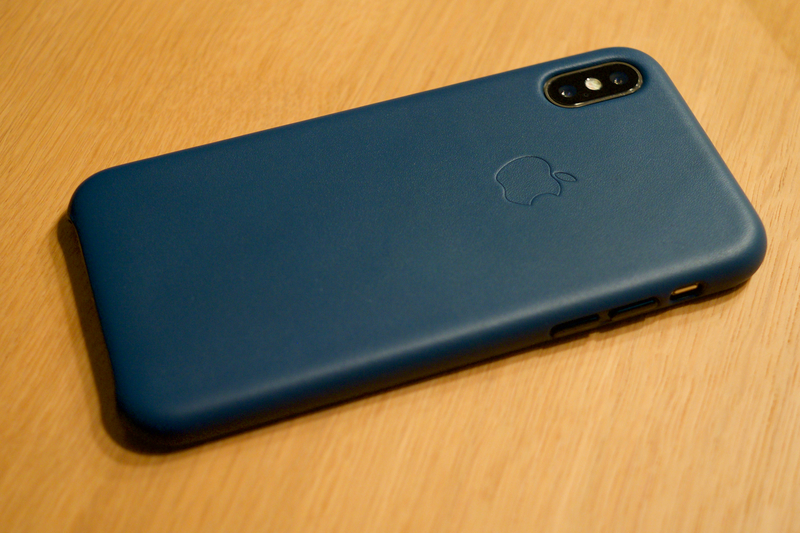 The Apple Leather Case feels like a quality product and I do like the new Cosmos Blue color, but I still think it is a shame to cover the shiny beauty of the silver iPhone X in a case. 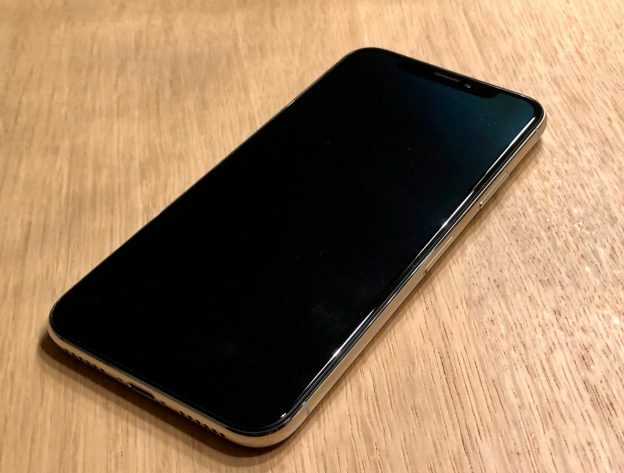 At least it avoids any wobbling on flat surfaces that the camera bump causes and I feel a lot more confident – less troubled – when putting the phone down on a hard surface like stone or metal. It’s fair to say I love this phone. It’s a gorgeous well built device. Impressive FaceID, the beautiful, big screen and all the other improvements, even in details, make this the greatest Apple product I have owned so far. Stay tuned for more, I will update this review after I had more time with the device. Especially more details on the camera and image quality are still to come.